Extended Tracking is the concept that a target's pose information will be available even when the Target is no longer in the field of view of the camera or cannot directly be tracked for other reasons. Extended Tracking utilizes the Device Tracker to improve tracking performance and sustain tracking even when the target is no longer in view. Prior to Vuforia Engine 7.2, Extended Tracking was enabled on a per-target basis using the appropriate APIs. Starting with Vuforia Engine 7.2, Extended Tracking is automatically enabled for all targets when the Positional Device Tracker is enabled. Use this feature to facilitate creating more robust applications, because any augmentations attached to these Targets will persist. In practice this means that after you point your device away from the initial Target, any augmentations maintain their positions with respect to the real world and are consistent with the initial reference frame defined by the target. The more detailed and feature-­rich the environment, the better Extended Tracking works. As of Vuforia Engine 7.2, Device Tracking/Extended Tracking features can leverage ARKit or ARCore if available on device. The following example depicts the impact of Device Tracking on an example Image Targets application. 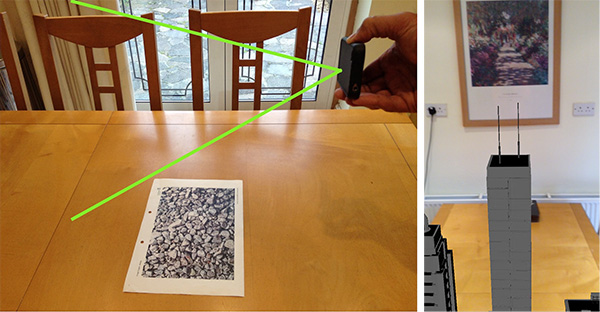 Figure A shows a device capturing an Image Target in its field of view (FOV). The result is Figure B, which shows the Image Target in view, along with augmentations. 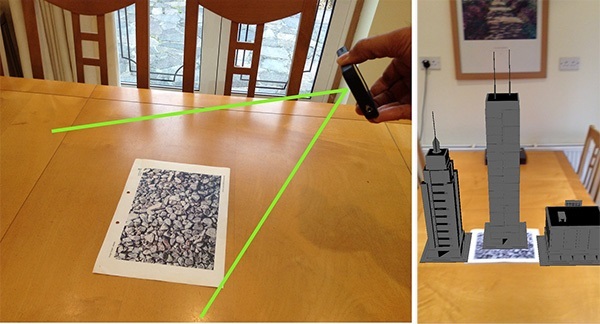 As Figure B shows, the augmentations of buildings on top of a wooden table are displayed on the screen of the device. This encourages the user to pan to these items by moving the angle of the camera to point upwards to see the top of the buildings, thereby making the Image Target disappear from view. Note that the Image Target does not need to remain in the view for the augmentations to appear when the Positional Device Tracker is enabled. That means that the augmentations persist without the target, and this capability supports more robust and continuous AR experiences. For more information about how to turn on the Positional Device Tracker to gain the benefits of Extended Tracking, please refer to Using the Device Tracker document.